I love Pinakbet specially when it comes from Ilocano places like Ilocos or Nueva Ecija! Every year when I come back to visit my family in the Philippines I always ask them to cook this Filipino dish! Hoay! this is a hapa hauloe ober here! I like this one very much! but daaaaaaaa I don't know how to make this one cause I'm from the states! But my auntie is going to show me how tooooooooo make it! Ha la ...AND NO ACK! It sure is a great dish, best cooked by Filipinos in the Philippines. I added a photo to your submission with kind thanks from wikipedia. 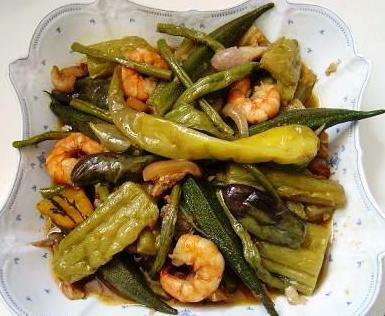 The photo shows Pinakbet with Shrimp! Thanks for sharing your favorite Filipino Dish!